Faith danced the night away on New Years Eve. Take a look and join the fun! This just in... Donald Trump flies high in London! Hey, we made it past the cold times and it is just about May! It's a time of baseball, flowers, more colorful and less burdensome clothes, and longer sunny days -- I look forward to these simple blessings every year. I say this despite the relentless waves of negative news seeping into our lives everyday. It doesn't stop. And it won't. What is our power in this? Our power is to not let anything or anyone steal our joy and our appreciation of what we do have. Our blessings. Our ability to appreciate those in our life. All the little things. They are yours. Don't let anyone take that from you. So far this year . . .
Tuesday night, March 26th, I was on the radio in NYC as Ken Gale's musical guest on his Pacifica Radio Eco-Logic program. I had promised an opening song that would include a kazoo solo. I brought extra kazoos hoping to enroll willing volunteers in a kazoo chorus. One of the members of my elite orchestra was Max Schmid. Max hosts WBAI's Golden Age of Radio program which features classic radio shows from yesteryear. I have listened to that show for years. Having bequeathed to him a kazoo Max told me that he owns radio's greatest collection of Jean Shepherd tapes and shows, yet has never owned a kazoo. I was honored to be the one to bring that imbalance in the force to an end. Shepherd, for those who do not know, often played a kazoo on his radio program. It is only right that Max Schmid would have one. That was an unexpected highlight from the evening. Here is a photo from the evening and an a link to the song that started the program. "Look What We've Done with This Song ! You can click here to watch the entire Eco-Logic episode, including the video of the song above, as recorded by Charlie Olsen for his The Environment TV website. "When the air or water are clean, thank an environmentalist. If not, become one." March 24 2019 was a Sunday. It was the first Sunday of the spring and the warmest weekend day we had for a while. People wanted to be outside, especially those who wanted to rally and participate in demonstrations. I participated in two of them. One was about Climate Change and the Green New Deal. The other was about the proposed building of jails in city communities without their involvement in any decision making about it. Here are some pictures and videos from my day in my home town. The Mayor of New York City has not consulted with communities in New York City about the the building of jails in their neighborhoods in four of the city's boroughs. Instead of meeting with community leaders before announcing the building of the jails he held private meetings excluding the communities and reporters. Sound like the way he handled Amazon's invitation to NYC? It is a management style being implemented, this time at the expense of neighborhoods without their consent or involvement with planning the changing of life where they live. The rally on the steps of City Hall on March 24, 2019 brought people together from across the city to voice their opinion and protest. Bronx Borough President Ruben Diaz Jr., small business leaders, and concerned citizens attended the rally. on March 24th in front of the Metropolitan Museum of Art. news outlets interviewing rally participants. I was interviewed by WBAI about the sign I was holding. It read "Remember the Children." Even the Koch brothers have children. And their children have children. No matter how rich you are we must share one planet. Fossil fuel and climate change will spare no one. It won't matter how rich you are or where you live when rising carbon dioxide and methane levels do their planetary damage. Eventually even they will come to know this. We must organize now and act to save ourselves and every child. Joel Landy and Songs of Freedom on Facebook! "Here's to the State of Donald Trump"
"You're A Joke, But Nobody Is Laughing"
Union Square Park in NYC. Children were represented with Faith and the Fist of Justice. Where will young leaders come from? at the end of January was terrific! Beyond performing in the Friday night concert welcoming everyone to our town, I reconnected with old friends and made new ones. What is the People's Music Network? The People s Music Network is a diverse community of singers, artists, activists and allies that cultivates music and cultural work as catalysts for a just and peaceful world. "We use music and culture to promote progressive ideas and values. We re committed to working with and supporting grassroots and community organizations, to explore and present the diversity of people s culture. We learn from our communities and each other and we have fun doing it!" PMN has been my "tribe", my extended family of friends and fellow activist/artists, since 1990. 2018 had numerous highlights to remember. Here is a recounting as we wind it back . . .
Brett Kavanaugh is now a Justice on the Supreme Court. Mitch McConnell singing his way into your heart and Hell. Here's a little song I wrote for my friends who did not vote. "I Can't Help Falling In Love with Me!" On New Years Day 2019 was on the radio, the musical guest of Ken Gale and his Eco-Logic program. Tune in at 8pm to WBAI-FM, 99.5 on your dial in New York City every other Tuesday for an hour dedicated to environmental issues and entertainment. Here is a link to Ken's Eco-Logic WBAI page and achives. You can listen to past programs in their entirety. Here is a Google page with Eco-Logic links. The Sixth Annual Woody Guthrie Brooklyn Hoot! at the Old Stone House was a terrific event and lots of fun. It was the sixth one we have done in Brooklyn and the 18th annual Woody Guthrie event produced by Steve Suffet. Thank you, Steve. And thank you for including me in each one. Thanks this year go to the Good Coffee House and the Folk Music Society of New York, Inc. for sponsoring the event. Thanks also to the talented artists who put on a great show. This year's crew included Vincent Cross, Emma Graves, Amy Dee, Nancy Moccaldi, Steve Suffet and yours truly. Special thanks to the wonderful audience, many of whom are familiar faces, who once again came to sing and support this special event. Let's do this again next year! and performances from the 2017 show! Upcoming Songs of Freedom TV Episodes & Viewing Times / Joel Landy and SOF on Facebook! What a Show! What a Night! The winds whipped and the rains came. It was truly a meteorological event Saturday night, October 27th when I blew into the Peoples' Voice Cafe for an evening of political cabaret along with the talented Aaron Fowler. Those in attendance were treated to an evening of fun and creativity in addition to the warm hospitality provided by the volunteers at New York City's premiere progressive venue. As you can see, I was assisted in my performance by my daughter, Faith, proving politics is a family affair. If you were wondering, my shirt says "Kavanaugh lied." If you did not make it to my show I think I know what happened. There was another short guy from Long Island named Joel who was playing at some Garden in Manhattan when I was on stage at the PVC. It is obvious to me a simple mistake occurred and you went to the wrong show. Understandable. In light of that here are a couple of musical videos from my PVC performance. The first is "a little song I wrote...for my friends who did not vote" Don't Worry. Be Happy! The second is Mitch McConnell singing his way into your heart and the gates of Hell. He gets what he wants By Any Means. I hope you voted! I hope your vote was counted in the way you intended! Let us not lose focus. Our work begins now. Our work always begins now. Keep up with Joel everyday by following him on Facebook. this is how I spent my summer vacation . . . The familiy's far out experience started with a trip to the 60s exhibit at the NY City Library (see left) and ventured to the Bronx and Yankee Stadium where Faith and Aunt Nori did the Y-M-C-A dance along with the field crew (below). The Pennsylvania part of the tour started in Johnstown and the Flood City Music Festival. Highlights included the performance by Andy Fasco and the UN. It wouldn't be a complete trip to Johnstown without visiting the city's flood museum and a trip up and down the Johnstown Inclined Plane. The Poconos' Bushkill Falls is a great place to go for a hike. You can get lost and find yourself in the woods. The summer started with the June 30 demonstration for immigrants and children's rights. Faith made her own signs for the occasion. June also featured the annual Porch Stomp on Governor's Island. I was honored to be part of this musical event. IN JULY Songs of Freedom Television was invited to play at the Roast N Co open mic in Kew Gardens, Queens. It was Roast N Co's first musical event at the Kew Gardens space last known as the Expresso Cafe. Prior to that it was known as Odradeks Coffee House, where Songs of Freedom hosted a series of hoots in 2015 and 2016. Thanks to Dennis Doyle for producing this gig celebrating local talent. Thanks also to the owners and staff of Kew Gardens's newest music venue. JUNE was memorable and lots of fun. It started with the People's Music Network weekend. The workshops and song swaps were both educational and inspirational. It satisfies my soul to spend time and sing with sympatico spirits who fight the good fight in their everyday lives. I shared a song at the Saturday night Round Robin that questioned male dominated decision making in our society and the damage that it does. PMN was followed by the June 21 Make Music NY event and the Porch Stomp at the end of the month. I created a total of eleven half hour Songs of Freedom programs from these events. You can view them all using the links below. Lots of music to enjoy. I hope you do. A New York City musical tradition. Here's a taste of street music and Make Music New York. The Red Pipe Cafe and Songs of Freedom TV hosted the solstice scene on Austin Street in Forest Hills, making friends and music well into the dark of the longest day of the year. A cast of strolling thousands and memorable New York characters added flavor to the scene. Join us next year on Solstice Day! Rene David Alkalay, Joel Landy, John MacLeod, and Joey on guitar! Make Music New York and how you can participate. Porch Stomp is a free, volunteer run, and community led folk festival held annually on Governors Island. This year there were more than 100 performances, jams and workshops featuring some of NYC's best bluegrass, old-time, blues, roots, and American music. Jeremy Aaron organized and hosted a porch stage with performers representing the People's Music Network and Greenwich Village Showcase. Songs of Freedom Television recorded much of the day at that stage. I performed a half hour set. Thank you, Jeremy for lending your organizing talent, your fiddle and your voice. I hope you all join us then! I edited six Songs of Freedom Television episodes from this year's Porch Stomp. Here they are. I hope you enjoy the performances and sing along! I see that I finally have your attention. Pay attention, Donald. I understand that you like to watch television. I have a few videos that you may find entertaining. The Songs of Freedom Television viewing schedule is listed below. View Songs of Freedom online ! Funny Songs Hour "Lightning Round"
Community Channel One Watch Online! In May the Eric Levine Memorial Concert at the Peoples' Voice Cafe in Manhattan was an awesome and heartfelt event. Friends and relatives remembered Eric's life and the contribution he made to so many people and organizations fighting the good fight. a personal rewrite of a classic homage, "I Dreamed I Saw Eric Levine Last Night." I will be posting more video from that special evening soon. Stay tuned! For more about the Peoples' Voice Cafe click on the link. What else? I played at the always awesome New England Folk Festival in April. It was a gas hosting the Funny Song Hour once again. Thanks to all of the people who showed up to share their funny songs and participate in an energetic and super fun hour. My favorite part was the frenetic "lightning round" at the end of the session where it was all about jumping in front of a camera and delivering a quick funny one. It was great. Take a look. Here it is. Note: Linda Leslie (see photo above) welcomed me to to the NEFFA family of performers years ago. She was an amazing and dedicated organizer committed to New England folk events. Linda passed away shortly before this year's festival began. She will be missed. Songs of Freedom remembers Linda Leslie and dedicates this year's performance to her memory. Throwin' Back 2017 The year in music. I was blessed to play in some great shows during 2017 and I got to help organize a couple of them. Whew! That was quite a year. On December 6th I joined Mike McHugh, Roger Blanc, Curtis Becraft, Paul DeCoster and others to celebrate the life and music of Tom Petty at Wicked Willy's on Bleecker Street in New York's Greenwich Village. The money from the show went to support MusiCares, a philanthropy Petty was honored by for giving his time and energy to. MusiCares helps musicians who have fallen on hard times with financial, medical and housing support. And here is part of my musical contribution to the event. It was the evening's opening number, "End of the Line", a song Petty helped to write and record with the Traveling Wilburys, one of the coolest bands of all time. The three and a half minute video features Roger Blanc on guitar and Curtis Becraft on mandolin and also explains the mission of the MusiCares organization. at the Old Stone House in Brooklyn was a blast! Vincent Cross, Beth Kotkin, Nancy Moccaldi, Anne Price, Steve Suffet, and yours truly. full Songs of Freedom episodes of the event here. "I Wish Woody Guthrie Was Here"
was a terrific evening of talent and community sharing. Thanks to all the artists who participated and played their favorite 1960s songs. Special thanks go to event organizers Mike McHugh, Vanessa Lovestone, William Mayr, and Max Christopher for putting on such a special show. It was cosponsored by Habitat for Humanity. We raised a few hundred dollars to build houses and relieve the suffering of those who lost so much. I hear there will be other Habitat for Humanity benefit shows coming up. Stay tuned for details! and here is my musical contribution to the evening. Every song was music from the 1960s when nuclear war was a threat, racial politics was in the news and in the streets, communities were organizing and finding their voice, and music of the times was the soundtrack of our lives. Be generous. Give what you can. episodes from the hurricane relief event. hosted its 2017 Water Festival on Sunday, August 27. It was a day of education, music, and entertainment about environmental awareness and action. Songs of Freedom Television was there to record what happened that day. This is the first episode about the Water Festival. It features the music of Joel Landy. Judy Gorman and John MacLeod. It was a fun and fabulous night of friends, food, family and music. What else is there? Here are links to songs from the August 16 show. If you missed it you can still enjoy it. Make Music New York in NYC. MMNY is an awesome event with more than 1,000 performances taking place to celebrate the summer solstice and the desire to sing where you live. Thanks to Jorge and The Local Bar in Long Island City for the memorable and fun time. Family, friends, and artists gathered on June 16 in NYC to remember and celebrate the life of Jessica Feinbloom. It was a memorable evening with lots of music and sweet stories. Thanks to Steve and Marilyn Suffet for engineering this event. Thanks also to others who participated. Gina Tlamsa, and Frank Woerner. In addition to the episodes all of the evening's performances can be viewed below. "You Fascists Bound to Lose" "Lonesome Valley"
Jane Babits / "If I Had A Hammer"
Gina Tlamsa "Peace Call" "Hobo's Lullaby"
Alison Kelley and Frank Woerner, "All Shall Be Well Again"
Alison Kelley Frank Woerner / "John Ball"
Anne Price, "The River Is Wide" "John Riley"
Steve Suffet "House of the Rising Sun" "Sadie Brown"
Toby Fagenson "Pastures of Plenty" "Precious Memories"
We Had A HOOT ! Actually, we had two. They were the first since May 2016 in this space when it was known as Odradeks Coffee House [see videos below]. The new owner, Garrick Aminov, bought the bistro last summer and agreed to host the March and April "Songs of Freedom presents" free to the public events. They turned out to be well attended and fun afternoons of music performed by talented neighbors and friends. A real community feeling - exactly what I had hoped for. Thank you to everyone who came to make it so special. Here are a couple of videos (click on the pics below). Al Kooper, and Jose Feliciano honed their craft on their way to becoming musical legends? The New England Folk Festival in April was so much fun this year - as it always is. I got to lead two sessions. The first was a FUNNY SONGS SWAP where I was joined by Steve Suffet and Mike Agranoff. The other was an hour long tribute to Phil Ochs. NEFFA is a special place, run completely by volunteers, and it has been going on for more than 60 years! It is an honor to be involved with them as part of the NEFFA family. Join us next year in Mansfield, Massachusetts. Here is a link for information all about it. I got to play at the Earth Day event at the Queens Museum sponsored by the United Nations Association of the United States of America, Queens Chapter. The theme this year was Climate Change, the most pressing issue facing our planet right now. The event was both entertaining and educational. There were panels and presentations and an all together positive experience for all who participated. There was even some group singing instigated by an eco-friendly neighborhood folk singer. Here are some vids from the educational afternoon. "New York City and the EPA. What Is Going On?" 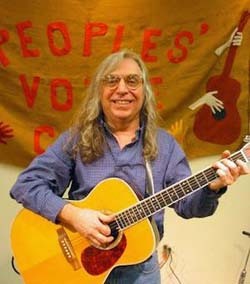 it was celebrating Steve Suffet at the Peoples' Voice Cafe in Manhattan on February 18th. Steve does so much for so many people, including booking acts at the PVC, it was righteous and right that he get a night devoted to him and the celebration of his 70th birthday. Artists included Anne Price, Sandy Pliskin, Beth Kotkin, Gina Tlamsa, Susan Lippman and myself. I had the honor of organizing the entertainment and MC'ing the event. Here is the opening song, written by Steve, and sung by the ensemble, followed by the official introduction to the evening. and here is the show's finale. Links to other songs and performances can be found below. Thanks to all of the volunteers that make the PVC such a special place. If you don't know about the Peoples' Voice Cafe, New York City's premiere progressive performance venue, click here for information about it and this season's schedule of performances. Can You Hear the Steam Whistle Blow? Click on the pic for cake and a story. I Can't Help Falling In Love with Me! on Austin Street in Forest Hills (between Continental and Ascam) hosts a jam session/singaround on Thursday nights. Bring an instrument and songs to share, or come along to sing and enjoy. It is fun and it is free - although it is important that you purchase something to eat or drink. I hope to see you soon at the Red Pipe Cafe! Here is a short video of what to expect. Details about Red Pipe Cafe can be seen in the link. KEEP WATCHING SONGS OF FREEDOM! In late November I assisted Donna Stein raise money for the environmental efforts of the Clearwater organization. I meet the most interesting people, including performers, when I volunteer for movements I believe in. Joel Landy were entertaining and inspiring. Thanks to Donna Stein and the leadership of the New York City Friends of Clearwater for their continuing efforts to protect and preserve our precious waterways. And thanks to the musicians, speakers, and volunteers for making this year's festival a success. Here are some photos from the the day and a video from the event. Stay tuned. More videos will be posted shortly. August 17th. Songs of Freedom Television was there to record the evening of topical music featuring one of topical music's brightest stars. The night was hosted at Aubergine Cafe by Steve Suffet and the Sunnyside Singers Club. If you missed the event you can watch videos of the concert by clicking on the links below. Full Songs of Freedom episodes of the evening will be streaming online and cablecast via NYC's public access tv soon. Watch this space for viewing times and channels. In addition to recording David Rovics' stellar performance I was invited to play two songs. Great music and great times. Here are some videos for you to enjoy. Odradeks gave us a lot of great music. It is now The Expresso Cafe in Kew Gardens. The May hootenanny at Odradeks Coffee House was a terrific evening. Thank you to all the fine performers who came to make music and have a fun time. Marie Moskowitz, Gina Moffet, and Steve Suffet. And thanks to Jake Block and the staff at Odradeks for inviting us in. We hope you enjoyed too! and the ensemble finale, "This Land Is Your Land"
Ultra cool things that happened this night included players showing up and while tuning their instruments in different parts of the room they started playing together. The whole building was filled with a jam before the evening started. So, I changed the format of the show. No formal introductions. Introduce yourself and play, accompanied by whomever you choose. The other ultra cool thing that happened was I started talking to a coffeehouse customer when I arrived. I asked him if he played an instrument. He said he played fiddle. I asked him if he lived nearby. He said yes. I told him to get his fiddle. He did and he played. He was excellent and then he sang too. Thank you, David Butler. The entire evening was magical like that. It was lots of fun playing and being with friends, despite my vocal challenges that evening, and it is always great playing along side my riding buddy and good friend, Steve. Ray Korona was a writer, producer, promoter, musician, an articulate advocate for artists and those fighting for justice and dignity, and a good friend. Many of us still cannot believe he is gone. On Saturday night April 16 at the Peoples' Voice Cafe in NYC friends and artists gathered to sing his songs and remember Ray. It was a heartfelt evening with inspired performances. Here is the finale to the show. Enjoy! And what a funny song swap it was! Thank you to Steve Suffet, Ben Grosscup and Jackson Gilman for joining me for the great session. It was a great evening with a wonderful audience and memorable performances. Thanks to the folks at the Jalopy for making it so special. Steve Suffet, Vincent Cross, Beth Kotkin, and Mike Glick for a special and fun time. Here are 3 videos from that show recently seen on Songs of Freedom TV. Thank you to everyone who made it another memorable evening. continued the Third Thursday Hoot series with spirited performances. Are You Going to Cut Medicare? What Do You Do with a Politician? Kew Gardens, Queens (see below) in December of 2015 was so successful I was invited to produce a monthly music event there. Unfortunately, Odradeks closed a the end of July in 2016. My goal is still to create a music scene in Queens similar to the one I did on Bleecker Street in Greenwich Village nine years ago, where souls conspired and played together. So, stay tuned folksingers, bards, and free spirits. We still have a world of music to make. For more about the Phil Ochs 75th birthday celebration at Odradeks Coffee House, including videos of the evening's performances, click here. HAPPY BIRTHDAY, PHIL OCHS ! It was a joyous night for both the audience and the artists who performed at Odradeks Coffee House in Kew Gardens, NY on Thursday night, December 17, celebrating Phil's life and music. Click on the photo links for more about that evening and video performances by David Massengill, Joel Landy, Steve Suffet, Anne Price, Lydia Adams Davis, Steve Vitoff, and Richard Benson. NEFFA, the New England Folk Festival, was a blast. I led two sessions. One was The Ultimate Parody Jam and the other was a Funny Song Swap. Check out the video here for a sample. at the Jalopy Theater and School of Music was an awesome show! We will be doing it again on April 3, 2016.
the Peoples' Voice Cafe in NYC. I thought it would be most appropriate to sing a song written by Matt Jones. I was featured at this showcase in NYC. The night before the House of Representatives voted for the bill that will fund and keep our government running. Republicans stuck goodies for the banking industry in there at the 11th hour written by their friends at CitiGroup. Enough Democrats voted for it to pass. There was other stuff in that bill too that the Senate passed and the President signed in the days that followed. Matt Jones devoted his life to the struggle of social justice in this country. Some time after the 1960s he articulated what we all now know - that the fight for freedom and equality has not ended at all. His song frames this stark perception vividly. He's a real live wire ! " "He's a real live wire!" happens every summer educating and entertaining citizens of our fair city and encourages everyone to protect and preserve our most precious resource. Artists and activists share their time and energy in this worthy cause. Here is a sample from a recent Water Festival. Take a look and join us! "I Am Selling Off My Body When I Die!" "Joel's engaging performance style has been nurtured through real experience in the TV studio and on the demonstration stage. He draws you in with the opening song and you're with him right through the encores!" "Joel is a dynamic performer who is able to connect with kids with special needs and adults alike. We consider Joel a Dream Team sponsor for his theme song and all of his voluntary efforts." To be notified about upcoming concerts and TV episodes, join the SOF mailing list. You can also inquire about purchasing CDs and DVDs of stage performances. Click on the picture of the cute baby for a little bit of Faith. Click on the family photo to see a movie.